Design a table to fit your decorating scheme, budget and wood-working ability. At its simplest, a coffee table is a slab of wood -- generally about 18 inches wide by 36 inches long -- atop a base usually about 15 inches high, although these dimensions can vary. The wood can be oak, maple or walnut for a formal style; teak or fir for Danish modern; pine or cedar for rustic or cypress; or similar wood for a tree-trunk table. Some people make coffee tables of old crates or pallets; some buy exotic hardwoods from specialty dealers. Anything can work with imagination and skill. Build a base. This can be as simple as four legs, square or round, which will fasten directly to the top. Or you can build a frame -- four legs joined on all sides by horizontal braces -- with the elements fashioned on a wood lathe, cut in special shapes with a band saw or similar tool or squared off with a table saw. Design your base so the screws or other joiners that hold it together are hidden. This can be done by mitering a rectangular box, then attaching legs and braces to it with screws from the inside. Or you can use mortise and tenon or similar jointing techniques. Make a top. This can be as simple as a couple of slabs of wood -- or even one very wide one -- smoothed on all sides and edges. Or you can glue several strips together, laid flat on a work surface and clamped on the sides. Or you can use plywood or other inexpensive board as a base, edge it with mitered molding of some sort, then fill the interior with cut squares, parquet insets or other finish lumber. It will take some special tools and wood-working skill to make parquet squares by cutting slices of wood and gluing them together, then cutting them into precise squares. Or you can just hunt up a giant cypress or redwood slab and set it on a tree trunk or other base. Finish with stain, paint or protective sealer. Sand all wood pieces thoroughly, to make them smooth and even. This can be done by hand, with a power hand sander or with a professional style planer/sander. All surfaces should be smooth and free of cut marks or other blemishes. Apply a stain of your choice or paint. 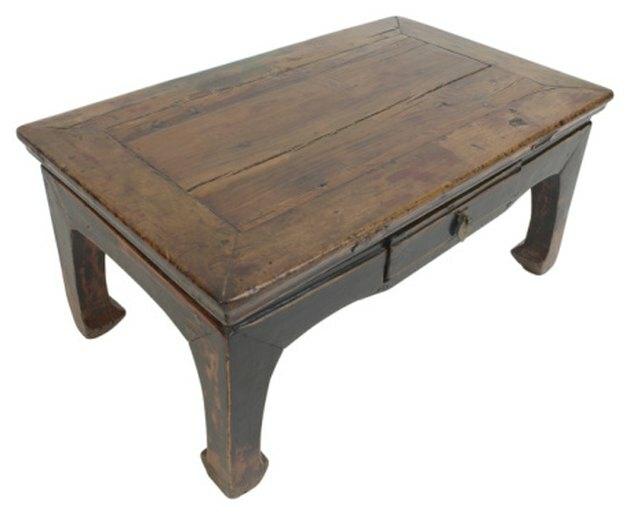 (For instance, one 50-plus-year-old oak coffee table was finished with multiple coats of tractor paint). If you use a stain, apply a polyurethane top coat, either glossy or satin finish, to protect the surface.